This article is about the fortress in the West Bank. For the land near the Caspian Sea, see Hyrcania. Hyrcania (Ancient Greek: Ὑρκανία; Arabic: Khirbet el-Mird) was an ancient fortress in the Judean Desert. The site was rebuilt during the Byzantine period as a monastery called Kastellion. The site is located on an isolated hill about 200 m above the Hyrcania valley, on its western edge. 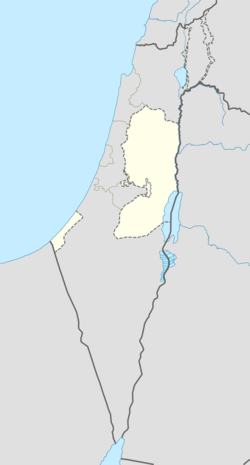 It is about 5 km west of Qumran, and 16 km east of Jerusalem. The site has not yet been thoroughly excavated. Current knowledge about the ruins of the site is based on a limited number of test pits. Hyrcania was apparently built by John Hyrcanus or his son Alexander Jannaeus in the 2nd or 1st century BC. The first mention of the fortress is during the reign of Salome Alexandra, the wife of Jannaeus, c. 75 BC: Flavius Josephus relates that, along with Machaerus and Alexandrion, Hyrcania was one of three fortresses that the queen did not give up when she handed control of her strongholds to the Pharisee party. The fortress is mentioned again in 57 BC when Alexander of Judaea, son of Aristobulus II, fled from the Roman governor of Syria, Aulus Gabinius, who had come to suppress the revolt Alexander had stirred up against Hyrcanus II. Alexander made to re-fortify Hyrcania, but eventually surrendered to Gabinius. The fortress was then razed. The Greek geographer Strabo also notes the destruction, along with that of Alexandrion and Machaerus, the "haunts of the robbers and the treasure-holds of the tyrants", at the direction of Gabinius's superior, the Roman general Pompey. Hyrcania is next reported in 33–32 BC being used in an uprising against Herod the Great led by the sister of Herod's executed former rival Antigonus. The fortress was retaken, and extended; it became notorious as a place where Herod imprisoned and killed his enemies, ultimately including his own son and heir Antipater. In later times St Sabbas the Sanctified founded a residence (cenobium) for hermits on the site in 492 AD, called the Kastellion, part of the satellite community or lavra associated with the monastery at Mar Saba 4 km to the south-west. Hermits remained until the 14th century, with a brief attempt made to re-establish the community between 1923 and 1939. This identification is based on Vita Sabae, the vita or biography of St Sabbas, and is generally accepted by researchers. The Aramaic descriptive term marda, "fortress", corresponds in meaning to the Greek name Kastellion, but should not be seen as a proper name for the site, Marda as a location name being reserved, as we can see from the vita of St Euthymius, for Masada, the Herodian palace-fortress near the Dead Sea which was briefly resettled by Byzantine monks. Some have identified the Hyrcania valley below the fortress with the Biblical valley of Achor, which is identified in the Copper Scroll of the Dead Sea Scrolls as the site of a great treasure. This has led to interest by treasure hunters in the area, despite it being subject to live-fire exercises by the Israeli army. Two ancient stepped tunnels cut down into the rock for a distance of 50 metres nearby were cleared of debris and sand in an investigation led by Oren Gutfeld of Hebrew University, but yielded only a Hasmonean-period clay pot and a skeleton. A large group of papyri, remnants of one or more monastic libraries of the 7th and 8th centuries AD, were excavated at the site in 1950 and now reside at the University of Leuven and the Palestine Archaeological Museum. Among the papyri is a 6th century Syriac fragment, designated syrmsK, which preserves the Western text-type of Acts 10:28-29, 32-41. ^ Flavius Josephus, Antiquities of the Jews, Book XIII, §416 (tr. William Whiston, 1895). "So Alexandra, not knowing what to do with any decency, committed the fortresses to them, all but Hyrcania, and Alexandrion, and Macherus, where her principal treasures were." ^ Watteeuw, Lieve. "Khirbet Mird Papyri – Research and Conservation Project in the Book Heritage Lab". KU Leuven. Retrieved 23 September 2018. ^ Metzger, Bruce (1994). A textual commentary on the Greek New Testament, second edition a companion volume to the United Bible Societies' Greek New Testament (4th rev. ed.). London; New York: United Bible Societies: United Bible Societies. O. Gutfeld (2008), "Hyrcania", in: E. Stern (ed. ), The New Encyclopedia of Archaeological Excavations in the Holy Land, Vol. 5, pp. 1787–1788. Wikimedia Commons has media related to Hyrcania (fortress). This page was last edited on 23 September 2018, at 20:00 (UTC).